Art documents life. Much of what is known today about past cultures and societies is based on or exclusively from what art has depicted — a fact that is too often forgotten. 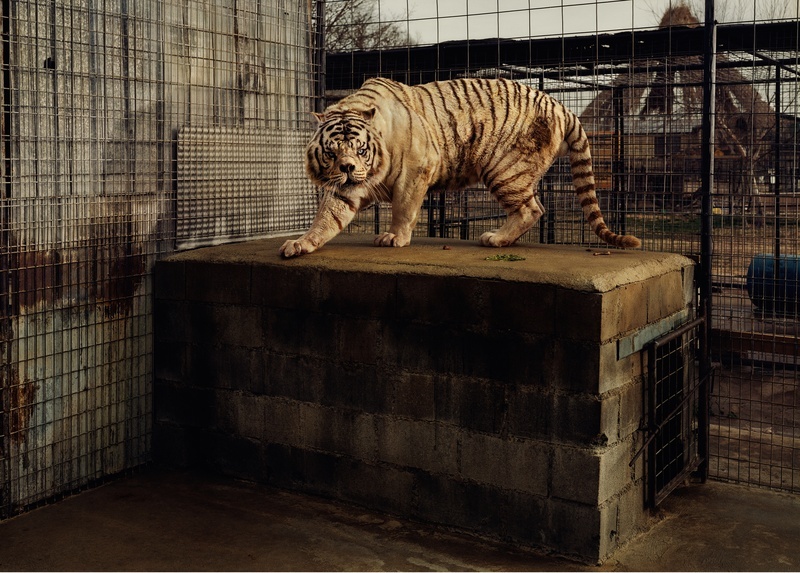 Taryn Simon’s six-project exhibition, currently at Galerie Rudolfinum, however, both demonstrates and utilizes this fact. A New York-based artist, Simon is known for using a variety of mediums to show the intricate nature of society through collections and classifications. The projects, created between 2007 and 2014 are Field Guide to Birds of the West Indies, Contraband, The Picture Collection, An American Index of the Hidden and Unfamiliar, Image Atlas, and Cutaways and these are showcased at the gallery until July 10th. Simon’s projects cover a variety of topics, but in all of them, she either uses past works of art to create her new projects, or she creates original art that documents the present, all leading back to the fact that the art chronicles society or society’s perceptions. In Field Guide to Birds of the West Indies and The Picture Collection, Simon comments on past works of art. The idea behind Field Guide to Birds of the West Indies is to draw attention to the forgotten and seemingly mundane. The project is a collection of photographs or stills of all of the birds in the James Bond franchise. However, the reasoning behind this project is that the name James Bond, made famous from the films, actually came from the author of the book, Birds of the West Indies. Yet, this is a forgotten fact, and those birds that the real James Bond spent his life studying, now are forever captured, but unnoticed in the films of the same name. For the project, Simon also shows a collection of the real James Bond’s artifacts. Simon’s desire was to show the real James Bond in the wake of the famous fake one. For The Picture Collection, Simon also uses old works, but these works were meant to be noticed. All of the images in this project are from the Mid-Manhattan Library’s collection of over 1.29 million archived pictures, including postcards and magazine clippings. However, Simon focuses on why certain pictures exist in the collection and why others do not. Her goal is to emphasize the accidental influence that people have on the ordinary, and the impact that it can actually have on future generations’ perceptions of society. Simon’s commentary on past works of art is enlightening and methodical, as she often spends years researching and creating her projects. Although, this isn’t surprising, considering that Simon is one of the leading contemporary artists in the world, and a Guggenheim Fellow. Two of Simon’s bigger projects at the exhibition are Contraband and An American Index of the Hidden and Unfamiliar, both focused on creating new art that documents the present, so that in the future, people will have a greater understanding of our current society. Both projects are also intriguing due to the mysterious nature of the subjects. Contraband is a collection of photographs that she took at the U.S. Customs and Border Protection Federal Inspection Site and at John F. Kennedy International Airport’s U.S. Post Office. It documents all of the items that people attempted to sneak into the U.S., but were seized by Customs including drugs, animal parts, and knock-off designer handbags. It gives viewers a glimpse into the black-market trade, in addition to the mind of the average traveler, who just wanted to sneak an item into the country illegally. Simon’s project shows a different side of society, the underbelly, not often portrayed in the history books. Similarly, An American Index of the Hidden and Unfamiliar also portrays a hidden world. Simon wanted to document the seldom seen or discussed facilities or subjects in the U.S., such as an explosives’ test area, a nuclear waste storage facility and live HIV. Very few are privy to information about or have access to these elusive subjects, and yet they are highly essential to our functioning society. Simon wanted to highlight how the foundation of society is controlled by a select few. Both of these projects act almost as exposés of society’s best kept, and yet widely known, secrets. The last two projects in Simon’s exhibition are Image Atlas and Cutaways. Image Atlas is a computer where guests can search any term on a search engine, and see what people from around the world are searching as well. The guest should be able to see what results appear based on the country. Her project opens up people’s awareness to show that images can be a common language amongst people from around the globe. Cutaways, on the other hand, shows how the media around the world is manipulated. The project is a reel of an interview, which Simon did in Russia. However, it is the unedited version, which shows that the Russian news station asked her to sit in silence staring at the reporters for numerous minutes, supposedly for editing purposes. She reveals the behind-the-scenes of media manipulation. These two projects depict how the world is much smaller than it seems, and that, no matter the country, visual images are the same. Looking at Taryn Simon’s exhibition from the perspective of an everyday Joe, Contraband, American Index of the Hidden and Unfamiliar, and Cutaways are captivating. They highlight secrets, the media, and mysterious notions. However, Field Guide to Birds of the West Indies and the Picture Collection, while conceptually fascinating, are duller to look at and, after understanding the meaning, are no longer interesting. While Image Atlas is barely worthy of mention. Conceptually, the project is brilliant, however, it was either too confusing or broken, making it irrelevant. As one of the leading contemporary American artists of her time, as well as a brilliant commentator on society at large, Taryn Simon’s self-titled exhibit at Prague’s Galerie Rudolfinum is worth the visit. Visitors learn cultural history, as well as examine modern society, and if nothing else, they will develop better analytical skills. Special note to all visitors: just don’t give up after Field Guide to Birds of the West Indies; it does get better.